In Java Cryptography Extensions (JCE), cryptography is discussed at the level that developers need to know to work with the JCE and with their own applications but that doesn’t overwhelm by packing in details unimportant to the busy professional. 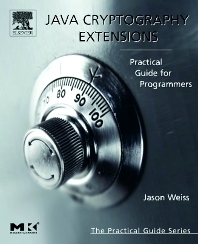 The JCE is explored using numerous code examples and instructional detail, with clearly presented sections on each aspect of the Java library. An online open-source cryptography toolkit and the code for all of the examples further reinforces the concepts covered within the book. No other resource presents so concisely or effectively the exact material needed to begin utilizing the JCE.